Rebutia canacruzensis R 642 (Collector Walter Rausch) Cana Cruz, Chuquisaca, Bolivia, 3700m. Origin and Habitat: Bolivia, Chuquisaca, Norrth of Cinti, near Cana Cruz. Altitude range: Around 3,700 metres altitude. Stem: Barely rising above ground level, less than 4 cm tall and 2.5 cm thick, greyish-green with purple tints. Areoles: Oval, approx 1 mm long, with white and brown wool. Radial spines: About 11, short, to mm long, bristle-like, not overlapping, glassy white, brown at base. 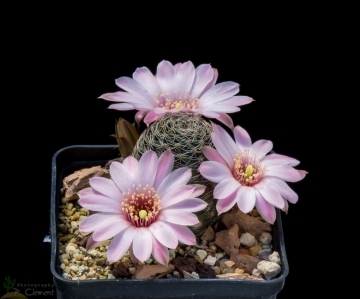 Flowers: 3.5cm long, 2.5 cm wide, pale shell-pink with a deeper pink throat fading to almost white on sunny days. Petals with an obscure, darker, narrow midstripe. 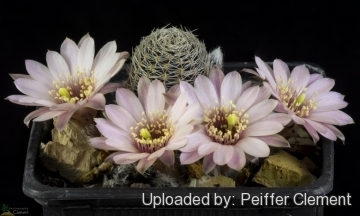 2) Rebutia canacruzensis Rausch, in Kakt. And. Sukk. 27(3): 49-50. 1976. 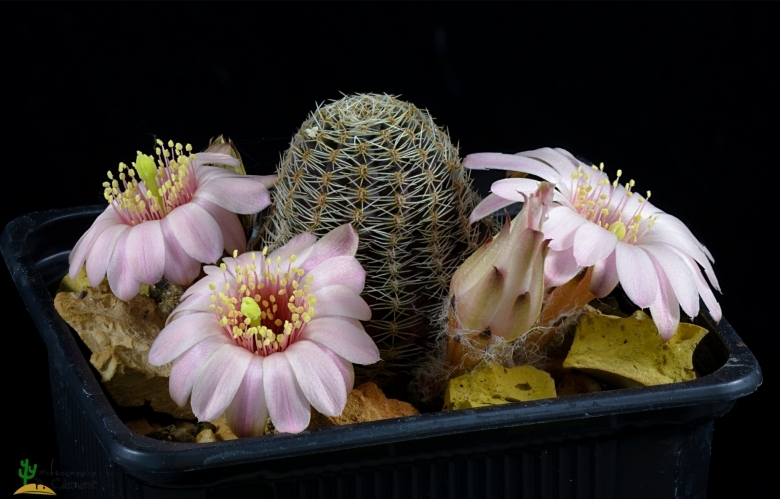 Cultivation and Propagation: Rebutia canacruzensis (Rebutia pygmaea) is a summer grower species that is easy to cultivate and recommended for beginners. 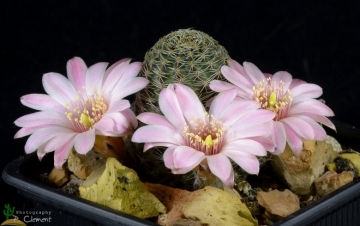 It has has delightful flowers and the plants remain compact, and clumps can easily be managed by division. Another advantage is that the plants are very cold hardy in Winter if kept dry.